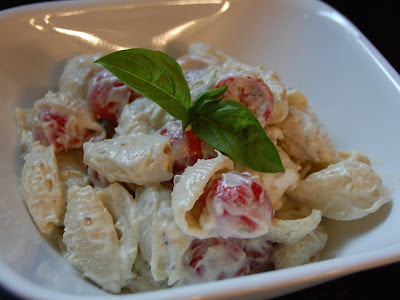 I have three different versions of pasta salad in my "repertoire" that I make regularly. One is a tri-color pasta salad with pepperoni cubes, cheddar cheese cubes, artichoke hearts, black olives, onions, green peppers, and Italian dressing. One is a creamy "deviled egg" pasta salad with mayonnaise and mustard, vinegar, sugar, hard-boiled eggs, paprika, and pickles. The one I'm sharing with you today is my third version, the one that is most requested at family gatherings, and definitely Joe's favorite. Since I can't seem to get enough pesto lately, I thought this would be the perfect accompaniment for our prosciutto pork kabobs. This is a delicious pasta salad. It's creamy and slightly sweet, and it has a nice balance of textures. I love the way the fresh mozzarella just melts in my mouth, almost as much as I love the pop and juiciness of the grape tomatoes. Red onion would be a nice addition to this salad, as would fresh basil or some cubed salami or pepperoni, but I like to keep it pretty straightforward. I hope your family likes this as much as ours does! 1. Cook pasta in salted water according to package directions; drain; rinse in cold water; drain again. 2. Meanwhile, whisk together mayonnaise, balsamic vinegar, sugar, pesto, and salt and pepper in a large bowl. 3. Add cooled, drained pasta to dressing; stir pasta to coat. Gently mix in fresh mozzarella and grape tomatoes. Chill until serving.